On-the-job injuries are not only traumatic, they can result in lifelong debilitation or even death. While civil negligence lawsuits are generally not permitted in these instances, workers and their survivors may be entitled to workers’ compensation benefits. Employers have a duty to maintain safe working environments for employees, and when they do not, there needs to be accountability. According to the United States Occupational Safety and Health Administration (OSHA), a New England manufacturer of stairs and cabinets has been fined $62,000 for violations involving machinery, dangerous chemicals and fire hazards after a safety investigation launched after a worker lost two fingers in an unsafe machine on which he was working. 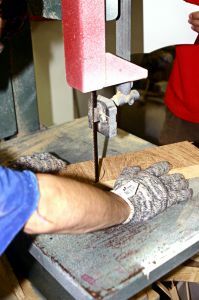 OSHA noted that if the machine had properly guarded, worker would not have lost his fingers. OSHA discovered numerous additional hazards while investigating this incident. A dust collection system, crucial in an area where sawing and drilling of wood occurs, lacked a required spark detector designed to prevent heated metal from entering the system and causing an explosion. Investigators also found improper disposal of flammable rags and spray booths lines with layers of old flammable solvent. Plus, there was flammable material in and around electric outlets, elevated workstations without safety railings, too few emergency exits, no emergency showers in the event of chemical exposure, insufficient protective gear and training and other serious violations. As our Boston workplace injury lawyers know, when an on-the-job accident occurs and a worker is killed, suffers an amputation or multiple workers are injured in a single incident, OSHA is required to perform a safety inspection. Factory environment can be inherently dangerous even when an employer is following all required safety protocols and properly training employees. When conditions such as this occur, the results can be serious or even fatal. Employers who are unwilling to provide a safe working environment are typically the same type of employers who deny valid claims for workers’ compensation after an employee is injured at work. If you have been injured on the job, it is important to take proper steps to help your attorney to secure a full and appropriate workers’ compensation award. The most important thing an injured worker can do is to make sure that everything is well-documented. This means making sure that an accident report is generated. If that does not happen, there are other ways to document that a workplace injury has occurred. One of those ways is to seek immediate medical attention and tell your healthcare provider how your injury occurred. You medical records can be introduced as evidence in the event that litigation is necessary. Another way you can bolster your case is by snapping pictures, when you can safely do so, of your injuries and the conditions which caused the accident at the job site. This will be especially important if the employer tries to claim that those hazardous conditions never existed or you were not injured on the job. While it may not seem like your employer would ever deny a valid claim, as we have seen, many employers and workers’ compensation insurance companies are far more concerned with making money than making sure an injured worker receives the fair benefits to which he or she is entitled.